Photo Gallery Tuesday " Lilies-of-the-Valley Basket "
Louisiana heiress and philanthropist Matilda Geddings Gray (1885–1971) acquired her first object by Fabergé in 1933. An artist herself, with a refined aesthetic sensibility, she was a sophisticated collector, while the name of the Russian artist-jeweler Peter Carl Fabergé (1846–1920) was almost unknown in the United States. Over the following years, Matilda Geddings Gray amassed one of the finest Fabergé collections in the world, and Fabergé's art has become widely known and internationally sought after. A selection of works by Fabergé from Matilda Geddings Gray's sumptuous collection is on long-term loan at The Metropolitan Museum of Art, and comprises this exhibition. Objects originally commissioned by and created for the Romanov family, such as the Lilies-of-the-Valley Basket—the most important Fabergé work in a U. S. collection—and three magnificent Imperial Easter Eggs, are on view. The exhibition will display works from the collection on a rotating schedule for five years. 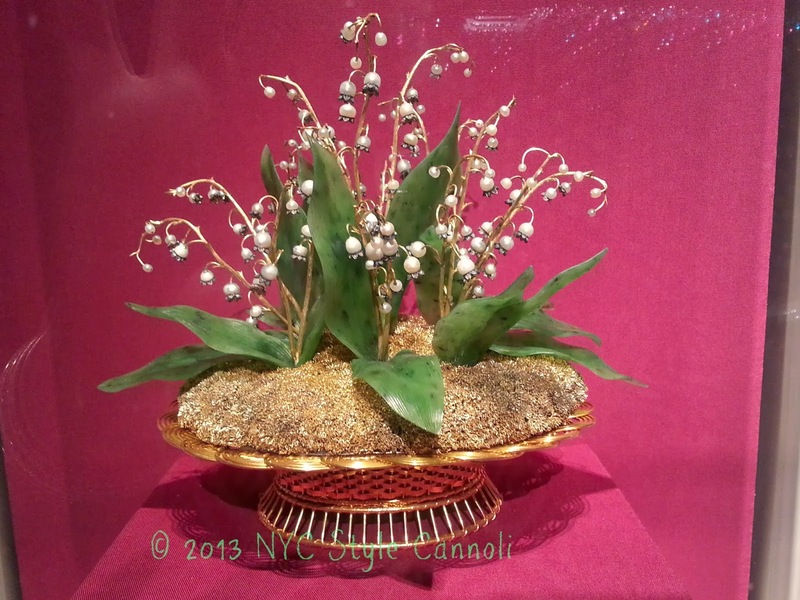 Iconic works from the House of Fabergé have not been on public view in New York since 2004. Another highlight of the exhibition is the Lilies-of-the-Valley Basket, considered to be Fabergé's floral masterpiece. It is the most important piece by the artisan in any collection in the United States. Made in 1896, it was originally presented to Czarina Alexandra Feodorovna and consists of nineteen individual stems emerging from nine separate plants in a "moss" of spun, fused, clipped, and polished green and yellow gold. Each pearl blossom is edged in silver set with rose-cut diamonds, with realistic leaves made of hard, dense nephrite and carved with the striations characteristic of the lily-of-the-valley plant. The czarina adored the Lilies-of- the-Valley Basket, as the blossoms were among her favorite flowers, and pearls her favorite jewels. She kept it on view in the private apartments and often took it with her when traveling. Be sure to check these classic works of art when you visit the Metropolitan Museum of Art. You will not be disappointed. WOW! It's beautiful! I do like how the flowers were made of pearls and diamonds! You know how much I like lilies!! You find the most interesting things to showcase! I'm amazed at all that you do, Rosemary! Yes ladies this is really quite a piece of art. In person you are just in awe of the beauty. Loved it so much!